A referendum on electoral reform took place by mail-in ballot between October 22 and December 7, 2018, in the Canadian province of British Columbia. This was British Columbia's third referendum on electoral reform since 2005. Voters were asked two questions: first, what electoral system should be used to determine election results—the existing first-past-the-post (FPTP) system or a proportional representation (PR) system; and second, what type of proportional voting system should be used if PR is chosen. In the second question, voters were asked to rank three proportional representation voting systems: dual-member proportional representation, mixed-member proportional representation, and rural–urban proportional representation. The referendum fulfilled an election commitment by the British Columbia New Democratic Party (NDP) during the 2017 election. Their platform promised a referendum and that the government would actively campaign for electoral reform. Results were released by Elections BC on December 20, 2018. British Columbians voted in favour of maintaining the first-past-the-post voting system rather than switching to a proportional representation voting system. BC has a long history of changing its electoral system. For BC's first election in 1871, the majority of ridings were elected using an "at large" system. This is the way city councillors are elected in BC to this day: a voter gets as many votes as there were people to be elected in the riding. Before the 2001 provincial election, the BC Liberal Party committed to appoint a Citizens' Assembly to investigate electoral reform, hold consultations, and prepare a report recommending whether a different electoral system should be adopted. The commitment was driven in part by the anomalous provincial election result in 1996, in which the BC New Democratic Party won reelection as a majority government with 39.5% of the vote and 39 seats, despite gaining a 3% smaller share of the popular vote than the Liberals at 41.8%, which translated into 33 Liberal seats. :90-91 In December 2004, the Assembly released its report recommending that the province adopt BC-STV, a BC-specific variant of the single transferable vote (STV) system. On May 17, 2005, a referendum was held in conjunction with the 2005 general election, in which voters were asked whether the province should adopt the recommendation of the Assembly to replace the first-past-the-post electoral system with BC-STV, or maintain the current system. While 57.7% of the electorate voted in favour of BC-STV, including a majority of voters in 77 of 79 ridings, its support failed to reach the 60% threshold set by the government and it was not adopted. Following the 2005 referendum, British Columbia held a second referendum on electoral reform in conjunction with the provincial election on May 12, 2009. It was the most recent referendum on electoral reform that has been held in British Columbia. As in 2005, voters in 2009 were asked to provide their opinions on the BC-STV electoral system proposed by the British Columbia Citizen's Assembly on Electoral Reform to ensure more proportional representation in the provincial Legislative Assembly. British Columbians were asked which electoral system should be used to elect legislators: the existing first-past-the-post electoral system or the proposed BC-STV system. The adoption of BC-STV in the 2009 referendum was defeated, with 60.9% voting against the reform and 39.09% of voters supporting the change. During the 2015 federal election, Justin Trudeau and the Liberal Party of Canada campaigned on the promise that it would be the last federal election under the first-past-the-post electoral system. The party's platform stated that a Liberal government would form an all-party Parliamentary committee, and introduce legislation within 18 months enacting electoral reform. On December 1, 2016, the House of Commons of Canada Special Committee on Electoral Reform released its report recommending Canada hold a referendum to adopt a proportional representation voting system for federal elections. Several months later, the government announced that it was no longer pursuing electoral reform. During the 2017 provincial election, both the NDP and the Green Party campaigned for PR and included the policy in their election platforms. On May 29, 2017, approximately three weeks after the election resulted in a BC Liberal minority government, the NDP and Green caucuses signed a supply and confidence agreement. The agreement included a section on PR, in which the parties agreed to put the issue to a referendum and that both parties would actively campaign for PR in the referendum. On June 22, 2017, the Liberal government tabled its throne speech, adopting the opposition parties' policy to hold a third referendum on electoral reform. On June 29, 2017, the BC Liberal government was defeated in a confidence vote. Lieutenant Governor Judith Guichon then invited the NDP to form a minority government with Green support. On November 30, 2017, the Electoral Reform Referendum 2018 Act was passed into law. It required the referendum to be held and authorized Cabinet to make various regulations. Between November 2017 and February 2018, Attorney General David Eby conducted a public consultation entitled "How We Vote". On May 30, 2018, he released the report on the consultation and recommendations concerning how the referendum process should be conducted. Cabinet accepted the recommendations shortly thereafter, in early June. Later in June, Vote PR BC launched their campaign for proportional representation, canvassing in cities across the province. Elections BC reviewed the referendum questions in June. On June 18, Chief Electoral Officer Anton Boegman wrote to the Speaker of the Legislative Assembly advising that in his view both questions were simple and clear enough for voters to understand. He also made recommendations for small changes to the questions. On June 22, 2018, the government released the regulations governing the referendum. The regulations adopted the changes to the question proposed by the Chief Electoral Officer, and set down other rules governing the campaign. On June 28, 2018, the Independent Contractors and Business Association (ICBA)—a lobby group for the construction industry— filed a lawsuit seeking an injunction to stop the referendum, or alternatively, to strike down the campaign financing rules governing the referendum. The lawsuit contains various complaints about the process, the referendum, and the systems on the ballot. In response, NDP MLA Bob D'Eith called the lawsuit an attempt to stop people from having a choice in their electoral system, and said ICBA does not want "ordinary people to have a stronger voice in the elections and I think they're desperate to hang on to the status quo". The Ministry of the Attorney General is defending the legislation in court. The official campaign began July 1, 2018. On July 17, 2018, ICBA's court application for an early trial date was dismissed by Justice Miriam Gropper of the British Columbia Supreme Court, in order to allow the government time to respond. Following the hearing, ICBA's lawyer, Peter Gall, told reporters ICBA would be seeking an interim injunction. On July 24, ICBA filed an application seeking an interim injunction to halt campaign financing rules and prevent ballots from being counted. The application was heard by Justice Gropper on August 7. In her decision handed down several weeks later, she dismissed the application calling ICBA's allegations about the referendum "rhetoric", "conjecture" and "exaggeration". In mid-September, the ICBA announced that they will be seeking leave to appeal Justice Gropper's ruling on the interim injunction. That same month, the British Columbia Government and Service Employees' Union was granted intervenor status by the court, siding against the ICBA. The appeal of Justice Gropper's judgement concerning the interim injunction was heard on November 2. Justice Fitch of the British Columbia Court of Appeal dismissed the appeal, finding that there was no merit to the ICBA's argument. Voters were asked two questions in the referendum. The first revolved around what electoral system should be used to determine election results: the existing first-past-the-post system or a proportional representation system. The second question explored what type of proportional voting system should be used if PR is chosen. This involved voters ranking three proportional representation voting systems: dual-member proportional representation, mixed-member proportional representation, and rural–urban proportional representation. The referendum asked voters to rank three proportional representation voting systems in order of preference: Voters ranked one, two, or all three systems. Dual-member proportional is an electoral system designed to produce proportional election results across a region by electing two representatives in each of the region's districts. The first seat in every district is awarded to the candidate who receives the most votes, similar to first-past-the-post voting. The second seat is awarded to one of the remaining district candidates so that proportionality is achieved across the region, using a calculation that aims to award parties their seats in the districts where they had their strongest performances. DMP was invented in 2013 by a University of Alberta mathematics student named Sean Graham. The system was intended as a possible replacement for first-past-the-post voting in Canadian national and provincial elections. Whereas campaigns to adopt MMP representation or the single transferable vote had recently been defeated in a number of Canadian provinces (such as the 2005 and 2009 British Columbia referendums, the 2005 Prince Edward Island referendum, and the 2007 Ontario referendum), the intent behind DMP was to gain broader acceptance by retaining salient features of first-past-the-post voting. These features include a one-vote ballot, relatively small districts (compared with STV), and a single tier of local representatives (in contrast to MMP). Mixed-member proportional is a mixed electoral system in which voters get two votes: one to decide the representative for their single-seat constituency, and one for a political party. Seats in the legislature are filled firstly by candidates in local ridings, and secondly, by party candidates based on the percentage of nationwide or region-wide votes that each party received. In 2004, MMP was recommended by the Law Commission of Canada to be adopted for federal elections. In 2007, Ontario held a provincial referendum to adopt the system, which failed to pass. In 2016, Prince Edward Island (PEI) voted to adopt MMP in a non-binding referendum. PEI will hold another referendum on the issue during the next provincial election. A form of MMP is used for national elections in New Zealand and Germany, and in the United Kingdom for elections to the devolved parliaments of Scotland and Wales (where the system is referred to as the Additional Member System). Simplified example of an STV ranked ballot used in an urban or semi-urban area under rural–urban proportional (RUP). RUP is the only system that lets voters rank individual candidates in order of preference. The hybrid approach taken by rural–urban proportional reflects lessons learned from previous attempts to pass electoral reform. A major advantage of rural–urban proportional as designed is that it requires creating far fewer top-up seats to achieve proportionality than MMP. Under rural–urban PR, no more than 10–15% of seats – versus 40% of seats under MMP – would need to be set aside as top-up seats to achieve proportionality, because the results from the urban and semi-urban areas would already be proportional owing to their voting having been conducted using STV. For rural areas, rural–urban proportional is advantageous because existing first-past-the-post rural ridings need to grow only 15% larger to facilitate extra regional top-up seats under it, compared to 67% larger if MMP was chosen or double in size if DMP was chosen. RUP is the only PR system of the three that lets voters rank individual candidates in order by preference. The use of STV ranked ballots means that all candidates must compete with one another for a voter's coveted first place ranking, including candidates running for the same party. Voters can rank long-shot independent candidates or candidates from unpopular parties first without fear of wasting their vote, because votes for badly performing candidates will be transferred during counting—based on each voter's preferences—to candidates who have yet to be eliminated, until all seats are won. In its scorecard of proportional voting systems, Fair Voting BC gave rural–urban proportional its highest ranking. During the Canadian government's 2016 consultation on electoral reform at the federal level, both the New Democratic Party of Canada and Green Party of Canada recommended Canada adopt either RUP or MMP. The official campaign began July 1, 2018. Groups had until July 6 to apply to Elections BC to be named the official proponent or opponent groups and receive $500,000 in public funding. On July 12, Elections BC announced that Vote PR BC would be the official proponent group and No BC Proportional Representation Society would be the official opponent group. Other individuals, groups and political parties are permitted to register as referendum advertisers with Elections BC, but are not eligible for public funds. The NDP and Green Party are campaigning for proportional representation. Sonia Furstenau, a Green MLA, held town halls about electoral reform in cities across the province in July and August. BC Premier John Horgan launched the NDP's referendum campaign in early September, saying "Proportional representation means exactly what it says. Whatever proportion, or share, of the vote a party wins, they get that many seats in government." Andrew Wilkinson, BC Liberal leader, is opposing the referendum and a change to a proportional representation system. Elections BC mailed a referendum information card to every household in the province between September 10 and 28, and a voter's guide between October 15 and 26. Voters receive their referendum voting package in the mail between October 22 and November 2. In early September, the members of the Canadian Union of Postal Workers voted in favour of job action. The strike resulted in Elections BC extending the voting deadline by a week. In early November, Horgan announced that he had cast his ballot for proportional representation, and that his first choice was MMP. Vote PR BC, the official proponent group, flew Andrew Coyne to Vancouver to give a talk endorsing PR, where Coyne announced he supports Rural–Urban Proportional. In late September, Andrew Wilkinson challenged John Horgan to a debate concerning the referendum, a challenge which Horgan accepted. The debate took place on November 8 at 7:00 pm. It was broadcast on CBC News and Global News. Official campaign organizations include the official proponent and opponent groups along with referendum advertising sponsors. On November 23, 2018, due to a postal strike, Elections BC extended the voting period deadline by a week – from November 30, 2018, to December 7, 2018. The deadline to register to vote remained midnight on November 23, 2018. Voters who were sent a voting package but did not receive it, or who need a replacement voting package, could request a replacement package up to December 7. All ballots must have been received by Elections BC by 4:30 pm on December 7. In response to a question from a constituent on Twitter, Elections BC clarified that ballots received by Elections BC's Referendum Service Offices or Service BC Centres up to and including 4:30 pm on December 7, 2018, but which had not been physically transferred to Elections BC's counting centre, would be accepted and counted as valid ballots. The government had plans for the required next steps had proportional representation passed. However, as it did not pass, the government will not implement any of these steps. Had a proportional system been adopted, the independent BC Electoral Boundaries Commission would have determined the number and location of new electoral districts. A legislative committee would have been tasked with determining whether the number of members of the Legislative Assembly should increase, and if so by how many (to a maximum of an additional eight). Some other aspects of how the new system would have worked would have also needed to be determined by a legislative committee. If a form of proportional representation had been adopted, the government had also committed to holding a further confirming referendum after two general elections. Voters in that future referendum would have had the option of maintaining the form of proportional representation adopted or switching back to the first-past-the-post electoral system. On October 2, 2018, the government introduced legislation to enact the requirement for this second referendum into law. If a change from the first-past-the-post system had been adopted in 2018, the bill would have required a second referendum on electoral reform to occur within 13 months of the second provincial general election held under the chosen proportional representation voting system (no later than November 30, 2026). As voters decided to keep the existing first-past-the-post system, this second referendum will not take place. Question: "Based on what you know, please indicate which of these two broad options you prefer for BC"
Question: "Based on how you feel right now, if you were to receive a voting package, which way would you vote on the first question?" On December 20, 2018, Elections BC announced that 61.3% of ballots were cast to maintain the First Past the Post voting system. A total of 1,391,423 ballots were considered. There were 1,378,753 valid votes for Question 1, and 831,760 valid votes for Question 2. 2,461 ballots were rejected. The current First Past the Post voting system received a majority of votes with 61.30% (845,235) of the valid votes for Question 1. Question 1: Which system should British Columbia use for provincial elections? Per the Electoral Reform Referendum 2018 Regulation, a second round of counting was required for Question 2 because no system won a majority of first preferences. RUP had the fewest first preferences, so it was eliminated and its votes were transferred to their second preferences. After the second round, the mixed-member proportional voting system was the system with the most support on Question 2. Question 2: If British Columbia adopts a proportional representation voting system, which of the following voting systems do you prefer? ^ a b Elections British Columbia (1988). "Electoral History of British Columbia 1871–1986" (PDF). Archived (PDF) from the original on 13 June 2011. Retrieved 21 June 2018. ^ a b c d Pilon, Dennis (2007). The politics of voting : reforming Canada's electoral system. Toronto: Emond Montgomery Publications. ISBN 9781552392362. OCLC 150223313. ^ Elections British Columbia (1988). "Electoral History of British Columbia 1871–1986" (PDF). pp. 231–232. Archived (PDF) from the original on 13 June 2011. Retrieved 21 June 2018. ^ Elections BC (2018). "Electoral History of B.C." Archived from the original on 26 June 2018. Retrieved 25 June 2018. ^ a b British Columbia Citizens' Assembly on Electoral Reform (December 2004). "Making Every Vote Count: The Case for Electoral Reform in British Columbia" (PDF). Government of British Columbia. Archived from the original (PDF) on 13 May 2005. Retrieved 15 June 2018. ^ Elections BC (May 17, 2005). "Statement of Votes – Referendum on Electoral Reform" (PDF). p. 9. Archived (PDF) from the original on 20 February 2018. Retrieved 4 June 2018. ^ Elections BC (May 12, 2009). "Statement of Votes – Referendum on Electoral Reform" (PDF). p. 20. Archived (PDF) from the original on 23 April 2018. Retrieved 4 June 2018. ^ "Electoral reform". Real Change. Liberal Party of Canada. Archived from the original on 21 June 2018. Retrieved 21 June 2018. ^ a b Meissner, Dirk (May 30, 2018). "B.C. electoral reform referendum includes two-part ballot question". The National Post. Retrieved 4 June 2018. ^ a b c Special Committee on Electoral Reform (December 1, 2016). Strengthening Democracy in Canada: Principles, Process and Public Engagement for Electoral Reform (Report). Parliament of Canada. Archived from the original on 8 April 2017. Retrieved 21 June 2018. ^ Stone, Laura. "Trudeau abandons electoral reform, breaking key campaign promise". The Globe and Mail. Archived from the original on 5 February 2017. Retrieved 6 February 2017. ^ Smith, Joanna (February 1, 2017). "Trudeau abandons promise for electoral reform". Maclean's. The Canadian Press. Archived from the original on 9 February 2017. Retrieved 21 June 2018. ^ "Platform 2017" (PDF). bcndp.ca. BC NDP. Archived (PDF) from the original on 10 May 2017. Retrieved 30 March 2018. ^ Omand, Geordon (May 18, 2017). "B.C. parties leave door open to electoral reform without a referendum". CBC News. Archived from the original on 4 June 2018. Retrieved 5 June 2018. ^ BC Green Party (2017). "Change You Can Count On: Platform 2017". Archived from the original on 12 June 2018. Retrieved 5 June 2018. ^ McElroy, Justin (May 29, 2017). "B.C. Green Party agrees to support NDP in the legislature". CBC News. Archived from the original on 5 June 2018. Retrieved 5 June 2018. ^ BC NDP Caucus (May 30, 2017). "2017 Confidence and Supply Agreement between the BC Green Caucus and the BC New Democrat Caucus" (PDF). Archived (PDF) from the original on 12 July 2017. Retrieved 5 June 2018. ^ Hipolito, Chad (May 31, 2018). "The road ahead for B.C. politics". The Globe and Mail. Archived from the original on 13 August 2017. Retrieved 5 June 2018. ^ Meissner, Dirk (June 23, 2017). "B.C. Throne Speech: Clark's Liberals Promise Electoral Reform Referendum, Sales Tax Cut". Huffington Post Canada. Archived from the original on 12 June 2018. Retrieved 11 June 2018. ^ "Speech from the Throne". Legislative Assembly of British Columbia. June 22, 2017. Archived from the original on 12 June 2018. Retrieved 11 June 2018. ^ McElroy, Justin. "NDP Leader John Horgan to be next premier of British Columbia". CBC News. Archived from the original on 30 June 2017. Retrieved 30 June 2017. ^ Hunter, Justine (November 30, 2017). "B.C. NDP, Greens flex partnership with swath of new policy achievements". The Globe and Mail. Archived from the original on 18 April 2018. Retrieved 23 June 2018. ^ Meissner, Dirk (November 23, 2017). "B.C. New Democrats invite public electoral reform vote; Liberals cry foul". Vancouver Sun. Archived from the original on 12 June 2018. Retrieved 7 June 2018. ^ a b c Eby, David (May 30, 2018). "How We Vote 2018 Electoral Reform Referendum: Report and Recommendations of the Attorney General" (PDF). Government of British Columbia. Archived (PDF) from the original on 31 August 2018. Retrieved 4 June 2018. ^ a b MacLeod, Andrew (May 30, 2018). "Eby Unveils Proposed Electoral Reform Referendum Questions". The Tyee. Archived from the original on 12 June 2018. Retrieved 4 June 2018. ^ Eagland, Nick (June 4, 2018). "New Zealand gives B.C. a lesson on proportional representation". Vancouver Sun. Archived from the original on 9 June 2018. Retrieved 6 June 2018. ^ a b Office of the Premier (June 7, 2018). "Premier's statement on recommendations for proportional representation referendum" (Press release). Government of British Columbia. Archived from the original on 12 June 2018. Retrieved 7 June 2018. ^ Fletcher, Tom (June 7, 2018). "B.C. cabinet approves multiple-choice voting referendum". The Chilliwack Progress. Black Press. Archived from the original on 12 June 2018. Retrieved 7 June 2018. ^ Grauer, Perrin (June 10, 2018). "Campaign to change B.C. voting system hits the streets, with Ontario election in mind". StarMetro Vancouver. Archived from the original on 12 June 2018. Retrieved 11 June 2018. ^ Ryan, Denise (June 10, 2018). "Canvassers take case for B.C. electoral reform to commuters". Vancouver Sun. Archived from the original on 12 June 2018. Retrieved 11 June 2018. ^ Boegman, Anton (June 18, 2018). "Letter to the Speaker of the Legislative Assembly" (PDF). Elections BC. Archived (PDF) from the original on 19 June 2018. Retrieved 19 June 2018. ^ Press Progress (June 19, 2018). "Elections BC Just Blew a Giant Hole in the Big Money Campaign Attacking Electoral Reform". Press Progress. Archived from the original on 20 June 2018. Retrieved 19 June 2018. ^ a b c d "Electoral Reform Referendum 2018 Regulation, Reg. 313/2018" (PDF). govTogetherBC. Government of British Columbia. June 22, 2018. Archived (PDF) from the original on 23 June 2018. Retrieved 23 June 2018. ^ The Canadian Press (June 22, 2018). "Electoral reform vote in B.C. includes $500,000 each for pro and con groups". The Globe and Mail. Retrieved 23 June 2018. ^ Little, Simon (June 22, 2018). "B.C. lays out rules for fall referendum on changing the way politicians are elected". Global News. Archived from the original on 23 June 2018. Retrieved 23 June 2018. ^ "About ICBA". icba.ca. Independent Contractors and Business Association. Archived from the original on 29 June 2018. Retrieved 29 June 2018. ^ a b Mulgrew, Ian (June 29, 2018). "Injunction sought to halt B.C. proportional representation vote". Vancouver Sun. Archived from the original on 29 June 2018. Retrieved 29 June 2018. ^ Kretzel, Lasia (June 29, 2018). "ICBA, Union seek injunction on proportional representation referendum". News 1130. Archived from the original on 1 July 2018. Retrieved 1 July 2018. ^ Bains, Camille (July 1, 2018). "B.C. referendum campaign launches as groups file petition to stop process". The Globe and Mail. Archived from the original on 4 July 2018. Retrieved 2 July 2018. ^ Mulgrew, Ian (July 18, 2018). "B.C. electoral system referendum foes lose first round". Vancouver Sun. Archived from the original on 18 July 2018. Retrieved 19 July 2018. ^ Fraser, Keith (August 28, 2018). "Judge refuses to stop B.C. 's referendum on proportional representation voting system". Vancouver Sun. Archived from the original on 29 August 2018. Retrieved 28 August 2018. ^ Ball, David (August 28, 2018). "Judge quashes attempt to halt mailing of ballots for B.C. 's referendum on electoral reform". The Star Vancouver. Archived from the original on 29 August 2018. Retrieved 29 August 2018. ^ Yuzda, Liza (September 13, 2018). "ICBA seeking appeal on proportional representation referendum injunction request". Global News. Archived from the original on 13 September 2018. Retrieved 13 September 2018. ^ Macdonald, Gord (September 28, 2018). "BCGEU joins legal fight over proportional representation referendum". Global News. Archived from the original on 29 September 2018. Retrieved 5 November 2018. ^ The Canadian Press (November 2, 2018). "Top B.C. court rejects group's attempt to stop electoral reform referendum". The Province. Archived from the original on 3 November 2018. Retrieved 2 November 2018. ^ McElroy, Justin (May 30, 2018). "B.C. to choose between 4 systems for electoral reform referendum". CBC News. Archived from the original on 4 June 2018. Retrieved 4 June 2018. ^ a b McElroy, Justin (June 2, 2018). "Know your voting systems: three types of electoral reform on B.C. 's ballot". CBC News. Archived from the original on 3 June 2018. Retrieved 4 June 2018. ^ Sean Graham (April 4, 2016). "Dual-Member Mixed Proportional: A New Electoral System for Canada" (PDF). Archived (PDF) from the original on 20 October 2017. Retrieved 18 June 2018. ^ PEI Special Committee on Democratic Renewal (November 27, 2015). "Recommendations in Response to the White Paper on Democratic Renewal" (PDF). Archived (PDF) from the original on 22 August 2016. Retrieved 18 June 2018. ^ "Dual Member Proportional (DMP)". elections.bc.ca. Elections BC. Archived from the original on 21 August 2018. Retrieved 20 August 2018. ^ Canadian House of Commons Special Committee on Electoral Reform (29 September 2016). "Meeting No. 33 Evidence". Archived from the original on 18 June 2018. Retrieved 18 June 2018. ^ The Guardian (October 29, 2016). "Editorial: We endorse DMP option in plebiscite". The Guardian. Archived from the original on 18 June 2018. Retrieved 18 June 2018. ^ "Mixed Member Proportional (MMP)". elections.bc.ca. Elections BC. Archived from the original on 21 August 2018. Retrieved 20 August 2018. ^ Law Commission of Canada (2004). "Voting Counts: Electoral Reform for Canada" (PDF). Minister of Public Works and Government Services. Archived (PDF) from the original on 20 October 2017. Retrieved 19 June 2018. ^ a b Ouellet, Valérie; Dubinsky, Zach (June 16, 2018). "The electoral game: What would Ontario results look like under a different voting system?". CBC News. Archived from the original on 18 June 2018. Retrieved 19 June 2018. ^ Bradley, Susan (8 November 2016). "P.E.I. plebiscite results favour mixed member proportional representation". CBC News. Archived from the original on 29 November 2016. Retrieved 8 November 2016. ^ CBC News (June 12, 2018). "Much-amended P.E.I. referendum legislation passes". CBC News. Archived from the original on 13 June 2018. Retrieved 13 June 2018. ^ Humphrey, Matt (June 25, 2018). "Why New Zealand's former prime minister believes proportional representation works better". CBC News. Retrieved 25 June 2018. ^ Fair Vote Canada (2018). "Mixed Member Proportional". Fair Vote Canada. Archived from the original on 24 July 2018. Retrieved 25 June 2018. ^ a b c Fair Vote Canada (2018). "Rural–Urban Proportional". Fair Vote Canada. Archived from the original on 24 July 2018. Retrieved 25 June 2018. ^ "Rural-Urban Proportional (RUP)". elections.bc.ca. Elections BC. Archived from the original on 21 August 2018. Retrieved 20 August 2018. ^ Zussman, Richard (May 30, 2018). 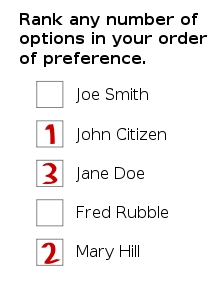 "British Columbians will vote on our electoral system — Here are the 4 options". Global News. Archived from the original on 15 June 2018. Retrieved 5 June 2018. ^ Bowler, Shaun; Grofman, Bernard, eds. (2000). Elections in Australia, Ireland, and Malta under the Single Transferable Vote. University of Michigan Press. ISBN 978-0-472-11159-6. JSTOR 10.3998/mpub.16507. ^ Dhillon, Sunny (June 17, 2018). "BC's proportional representation voting system options include two that are lesser known". The Globe and Mail. Archived from the original on 21 June 2018. Retrieved 21 June 2018. ^ Fair Voting BC. "Scorecard". Fair Voting BC. Archived from the original on 4 July 2018. Retrieved 3 July 2018. ^ Wherry, Aaron; Tasker, John Paul (December 1, 2016). "Minister 'disappointed' as electoral reform committee recommends referendum on proportional representation". CBC News. Archived from the original on 12 April 2018. Retrieved 25 June 2018. ^ "2018 Referendum Funding". elections.bc.ca. Elections BC. Archived from the original on 27 June 2018. Retrieved 26 June 2018. ^ The Canadian Press (July 12, 2018). "Yes and No groups selected before B.C. 's electoral reform referendum". CTV News. Archived from the original on 13 July 2018. Retrieved 14 July 2018. ^ "2018 Referendum Funding". elections.bc.ca. Elections BC. Archived from the original on 27 June 2018. Retrieved 14 July 2018. ^ Slack, Jeff (July 19, 2018). "Green Party MLA holding forum on Electoral Reform in PG". My Prince George Now. Archived from the original on 8 September 2018. Retrieved 7 September 2018. ^ Staff (August 21, 2018). "Green MLA Furstenau visits Nelson-Creston riding". Nelson Daily. Archived from the original on 8 September 2018. Retrieved 7 September 2018. ^ Eckford, Sean (August 24, 2018). "Simons and Green MLAs discuss PR, cooperation". Coast Reporter. Archived from the original on 8 September 2018. Retrieved 7 September 2018. ^ Palmer, Vaughn (September 7, 2018). "Horgan selling positives of electoral change, but there are negatives". Vancouver Sun. Archived from the original on 7 September 2018. Retrieved 7 September 2018. ^ Smyth, Mike (June 3, 2018). "B.C. Liberals declare all-out war on proportional representation". The Province. Archived from the original on 8 September 2018. Retrieved 7 September 2018. ^ Fletcher, Tom (September 10, 2018). "Voter registration push begins for B.C. referendum". Castlegar News. Archived from the original on 11 September 2018. Retrieved 10 September 2018. ^ a b "Referendum Resources". elections.bc.ca. Elections BC. Archived from the original on 8 September 2018. Retrieved 11 September 2018. ^ a b "Voting period for electoral reform referendum extended due to postal strike". CBC News. November 23, 2018. Retrieved 23 November 2018. ^ CBC News (November 1, 2018). "John Horgan: I voted for mixed-member proportional in electoral reform referendum". CBC News. Archived from the original on 4 November 2018. Retrieved 5 November 2018. ^ "Tomorrow noted political commentator @ACoyne joins us for a lively discussion on Pro Rep. Are you planning on taking part? RSVP here to attend: #PR4BC #ProRep #BCPoli". Facebook. October 24, 2018. Retrieved 8 November 2018. ^ Coyne, Andrew (2018-10-30). "Andrew Coyne: Which electoral system for B.C.? Any option is better than the status quo". National Post. Retrieved 12 November 2018. ^ CBC News (October 30, 2018). "B.C. premier, opposition leader to face off in electoral reform debate". CBC News. Archived from the original on 30 October 2018. Retrieved 31 October 2018. ^ "2018 Referendum Advertising Sponsors" (PDF). elections.bc.ca. Elections BC. December 8, 2018. Archived (PDF) from the original on 8 December 2018. Retrieved 8 December 2018. ^ Elections BC [@ElectionsBC] (December 14, 2018). "Hi Doug – Yes, completed voting packages received by Elections BC by mail or in person at a Referendum Service Office or Service BC Centre by 4:30 p.m. on December 7, 2018 were accepted for counting" (Tweet). Retrieved December 19, 2018 – via Twitter. ^ "What happens after the referendum?". elections.bc.ca. Elections BC. Archived from the original on 25 August 2018. Retrieved 24 August 2018. ^ Zussman, Richard (June 7, 2018). "B.C. cabinet confirms format of electoral reform referendum". Global News. Archived from the original on 12 June 2018. Retrieved 25 June 2018. ^ Zussman, Richard (October 2, 2018). "B.C. Government to legislate a second referendum on electoral reform if new system passes". Global News. Archived from the original on 2 October 2018. Retrieved 3 October 2018. ^ CHEK News (October 2, 2018). "Legislation proposed for a confirming referendum if B.C. voters choose proportional representation". CHEK News. Archived from the original on 4 October 2018. Retrieved 3 October 2018. ^ "Snap Election? Snap out of it, say majority of British Columbians - Angus Reid Institute". Angus Reid Institute. 2017-06-17. Archived from the original on 23 October 2018. Retrieved 23 October 2018. ^ "British Columbians call on new provincial government to deliver electoral reform, energy projects - Angus Reid Institute". Angus Reid Institute. 2017-09-25. Archived from the original on 23 October 2018. Retrieved 23 October 2018. ^ "Site C: By margin of two-to-one, BC residents say province made the right call to finish dam project - Angus Reid Institute". Angus Reid Institute. 2018-01-11. Archived from the original on 23 October 2018. Retrieved 23 October 2018. ^ "Proportional Representation: BC residents split three ways over whether to change voting system - Angus Reid Institute". Angus Reid Institute. 2018-09-27. Archived from the original on 30 September 2018. Retrieved 23 October 2018. ^ "National release tables - Angus Reid Survey September 9 2017" (PDF). angusreid.org. Archived (PDF) from the original on 23 October 2018. Retrieved 26 October 2018. ^ a b "Mainstreet Research - BC UltraPoll Release". Mainstreet. 2018-11-08. Retrieved 15 November 2018. ^ Breguet, Bryan. "Too Close To Call: Exclusive poll: The referendum on electoral reform in BC is a toss-up". Too Close To Call. Retrieved 20 November 2018. ^ a b c d e "2018 Referendum Voting Results". Elections BC. 2018-12-20. Retrieved 2018-12-20. ^ a b c d e "2018 Referendum on Electoral Reform - Provincial Results" (PDF). Elections BC. 2018-12-20. Retrieved 2018-12-20. ^ Ball, David (2018-12-20). "'No' wins 61 per cent of the vote in proportional representation referendum, Elections BC announces". The Star. Retrieved 2018-12-20. ^ Eagland, Nick (2018-12-20). "No change: B.C. voters back first-past-the-post system in electoral reform referendum". Vancouver Sun. Retrieved 2018-12-20. ^ "B.C. votes to keep first-past-the-post electoral system". CBC News. 2018-12-20. Retrieved 2018-12-20. Elections BC announced the results Thursday, saying 61.3 per cent of ballots had been cast in favour of the status quo, while proportional representation got 38.7 per cent. ^ "Voting results by electoral district". Elections BC. 2018-12-20. Retrieved 2018-12-20.